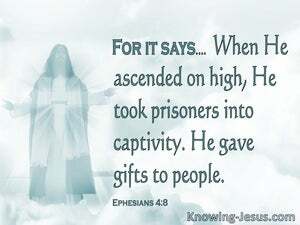 ﻿ Ephesians 4:8 Therefore he saith, When he ascended up on high, he led captivity captive and gave gifts unto men. Therefore he saith, When he ascended up on high, he led captivity captive and gave gifts unto men. Therefore it says, "WHEN HE ASCENDED ON HIGH, HE LED CAPTIVE A HOST OF CAPTIVES, AND HE GAVE GIFTS TO MEN." For it says: When He ascended on high, He took prisoners into captivity; He gave gifts to people. 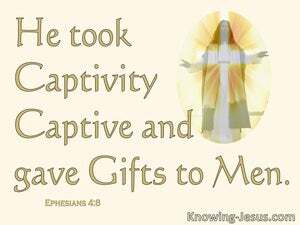 That is why God says, "When he went up to the highest place, he led captives into captivity and gave gifts to people." Therefore he says, Having ascended on high, he led captivity captive, and gave gifts to men. Wherefore he saith, When he ascended on high, he led captivity captive, And gave gifts unto men. Therefore it is said, When He ascended on high, He led captivity captive [He led a train of vanquished foes] and He bestowed gifts on men. Therefore, it says [Psa. 68:18], "When He ascended on high [i.e., to heaven], He led a procession of captured prisoners [behind Him] [Note: This originally referred to God leading His people in triumph over Israel's enemies, but here is applied to Christ], and gave gifts to [various] people." For which reason, the scripture says: When he ascended on high, he led captive a multitude of captives, and gave gifts to men. For this reason he says, He went up on high, taking his prisoners with him, and gave freely to men. Therefore it says, "When he ascended on high, he led a host of captives, and he gave gifts to men." wherefore 'tis said, " when he ascended up on high, he made a number of captives, and gave gifts to men." Wherefore he says, Having ascended up on high, he has led captivity captive, and has given gifts to men. Therefore he says, Having ascended upon high, he led captivity captive, and gave gifts to the people. So it says, "When he went up on high, he led a host of captives, And gave gifts to mankind." Wherefore he saith, Having ascended on high, he led captivity captive, and gave gifts to men. Wherefore he says, Having ascended into height, he made captivity captive, and gave gifts to men. 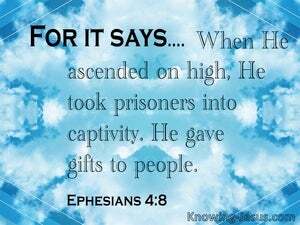 Therefore he says, When he ascended up on high, he led captivity captive, and gave gifts unto men. Therefore it says, "Ascending on high he led captivity captive; he gave gifts to men." Therefore He says, "When He ascended up on high, He led captivity captive and gave gifts to men." Wherefore he saith, "He is gone up on high, and hath led captivity captive, and hath given gifts unto men." Thus it is said, When he ascended on high he led a host captive and granted gifts to men. Thus it is said, When he ascended on high, he led captivity captive and gave gifts to men. Therefore it says, "When he ascended on high he captured captives; he gave gifts to men." Therefore he says, "When he ascended on high, he led captivity captive, and gave gifts to men." Wherefore he saith: "When he ascended on high, he led captive a train of captives, and gave gifts to men." Wherefore he says, When he ascended on high, he took captivity captive, and gave gifts to men. Wherefore he saith - Ascending on high, he took captivity captive, and gave gifts unto men. Wherefore the Scripture saith, "When he ascended up on high, he led captivity captive, and gave gifts unto men." Wherefore he saith, When he ascended on high, he led captivity captive, and gave gifts to men. For this reason Scripture says: "He re-ascended on high, He led captive a host of captives, and gave gifts to men." Concerning this the Scripture says: "He led a host of captives, when He went up on high, and granted gifts to men." Wherefore, He saith, "Having ascended on high, He led captivity captive, and gave gifts to men." Wherefore it is said, "When he ascended on high, He led captivity captive, and gave gifts to men." 7 But unto each one of us is given grace according to the measure of the gift of the Christ. 8 Therefore he saith, When he ascended up on high, he led captivity captive and gave gifts unto men. 9 (Now that he ascended, what is it but that he also descended first into the lower parts of the earth? Thou hast ascended on high, thou hast led captivity captive; thou hast received gifts for men, yea, for the rebellious also that the LORD God might dwell among them. and having spoiled the principalities and the powers, he made a show of them openly, triumphing over them in it. Rise up, rise up, Deborah; rise up, rise up, sing a song. Stand up, Barak and lead thy captivity captive, thou son of Abinoam. Then the king made a great banquet unto all his princes and his slaves, the banquet of Esther; and he made a release to the provinces of their taxes and gave gifts according to the power of the king.